I found a little surprise in the mailbox today. If there is one thing I don't need, it is love from a Witch Elf. They... hurt. Notice the spelling , 'which' and the question mark. A mystery is afoot. On the back was '11/13 R'. Wizards and Wenches has some good thoughts and coverage here. If those two new classes come out that close to my wife's birthday, I'm going to get in trouble. I received a note from Mythic in the mail yesterday. I'll scan it tonight when I get home and post it on my site. Rick: I have a feeling you will be back :) I am having a good time, but the game isn't the only one I play... so I don't really get burned out. ok so my gues is that the dark elve's holiday "death night" is going to be friday the thirteenth, and that morathi the wich queen will be involved as she is the focal point of the holiday. has nothing to do with valitines day, enless you enjoy bathing in the blood of anyone cought so you can stay young. Hey Werit, is the R an uppercase or lowercase R? The holiest time of the year for Dark Elves is Death Night. During this night the Witch Elves rule the streets of the Dark Elf cities, capturing anyone they find (whether they are slaves or Dark Elves) and dragging them back to the temples as sacrifice to Khaine. The Witch Elves will even go so far as to break into houses, which has led to Dark Elf families barricading windows and doors during this night. On Death Night, the Witch Elves will also steal away a number of children. Girls captured like this will be trained to become Witch Elves. Boys are tossed in a cauldron of boiling blood. Those that survive are trained to be true adepts of Khaine: the feared assassins. As dawn breaks after Death Night, it is customary for those who lived through the night to make a sacrifice from their own household (usually a favoured slave or elderly relative) as a thanks to the Lord of Murder for sparing their family. Wonder if this will have something to do with their event. It was an upper case R.
Has anyone thought that the numbers are office admin to keep count of how many they've sent out? Yours was the 11th of a total of 13 letters in total? Bah ignore me - didn't see the letters heh...! 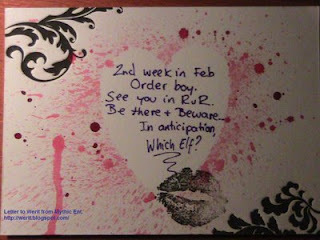 Well, assuming a lot of letters and assuming the letters are scrambled, I came up with WAR Invitation. Maybe all together it's a massive invitation to the Valentine's Day live event. Hey, I'm wondering if on the back was a capitalized 'R' or not? @anon: It is indeed capital. friday the 13th is death night. sat the 14th is valentines day. WAR event -i-t- maybe if read backwards. the A and R are capitalized, not sure about the 'i' though. Also the blank before 'i' may be an 's', making it events. spamtastic, brew day was totally order holiday, this is epic for destruction. Do you think that Witch Elves Honestly need a Kill everything buff?!? Is this what everyone else has or am I incorrect anywhere? Just got my letter today! I'm leaning towards a War event starting Monday the 9th of February going thru Friday the 13th (Night of Murder) and all tieing in with Valentines day the 14th explaining the LOVELY valentines you all got.